What about a Valentine’s Day Movie Night? Valentine’s Day is coming up mid-week on a Wednesday this year. Take an over the top approach to your romantic day with a movie for you and your honey in you own backyard! 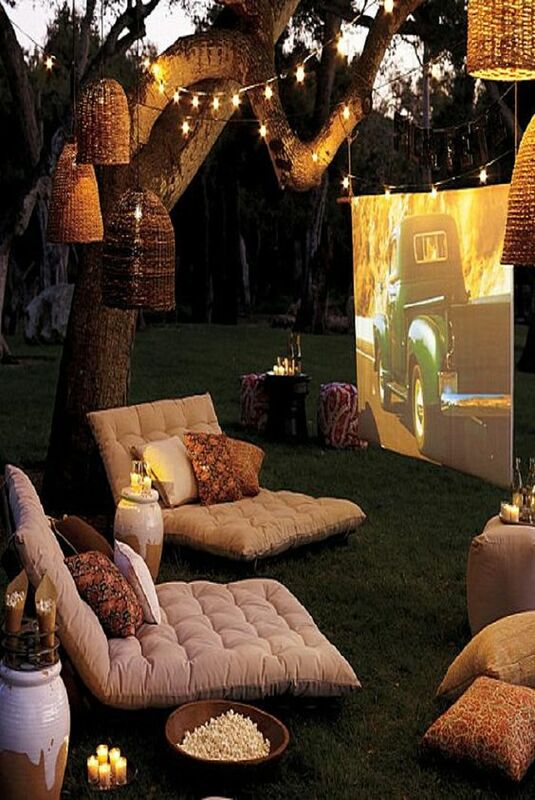 Imagine suprising your loved one with your own outdoor theater! Love is in the air! And your Valentine will love these romantic movies as displayed on your Backyard Theater Systems outdoor theater! La la Land (2016) A big red Valentine to Los Angeles, and the dreamers who inhabit it, La La Land has gorgeous costumes, dizzying choreography and a singing, dancing Ryan Gosling. What’s not to love? The Notebook (2004) That iconic rain-soaked kiss makes The Notebook a romantic classic, powered by the palpable chemistry between Ryan Gosling and Rachel McAdams, but what really brings on the tears is the relationship between their older characters, played by James Garner and director Cassavetes’s mother Gena Rowlands. Summer’s Coming: Greet It With a New Addition to Your Backyard! Are you ready for the longer days and warmer nights to come? Then there’s no better way to get your summer off to the right start than by equipping your back yard with its very own outdoor theater system! Everyone is looking for fun things to do. Your house might become the most popular place on your block once you start inviting friends over for summer movie nights. Temperatures are mild enough to enjoy the experience of combining the natural world with the artificial world of the cinema. But what about those longer days? It’s true that you may have to start your movie watching a bit later in the evening during the summer months. Since projector systems require a reasonably dark ambience for an optimal image. Furthermore there numerous online sunset/sunrise calculators and other data sources you can use, including your local newspaper or weather channel. There’s no excuse not to give your family and friends the sheer fun of the backyard theater experience this summer. Why Buy From Backyard Theater Systems? A complete solution to your outdoor home theater needs. You can get everything you need in one fully integrated package. Our systems are optimized to work as a cohesive unit. Most of the components are designed and manufactured exclusively for our company. We offer a wide variety of screens and projectors to fit anyone’s budget and entertainment needs. Our theater systems are designed to offer superb quality, for a truly immersive home theater experience. Without the noisy fans of inflatable screens and other distracting missteps. Our packages provide exciting options such as rear and front projection screens, Wi-Fi enabled Blu-Ray players and even 3-D capability on all Optoma projectors. We also offer a 1-year in house warranty on all our systems. Family-owned and operated since 2009. With us you’re not just getting an outdoor theater; you’re also getting a dedicated team who are happy to help you select the perfect backyard theater package for your needs. Also if you have any questions about the set up we are here to help. Complete with fast, free shipping and a 30-day satisfaction guarantee. With this unique combination of benefits we are confident you will love your new outdoor theater package from Backyard Theater Systems. Contact us today and learn more about the Backyard Theater Systems difference! Has it gotten harder and harder every holiday season to come up with original, dazzling gifts for friends and family members? If you feel like you’re shopping from the same Holiday list every year, maybe it’s time you hit a genuine holiday home run. An outdoor theater package from Backyard Theater Systems can make an unforgettable Holiday present for your family – or for any other important family in your life! If you think about it, the timing of the December holidays couldn’t better for putting a brand-new big-screen theater system under your own tree this Christmas. You’ll (hopefully) be off from work, the kids will be home from school, and you’ll all be a little stir crazy with the extra time on your hands. What better time to set up the screen, fire up the projector and enjoy some quality time in gorgeous high definition video and rich stereo sound? If Jack Frost is making the great outdoors somewhat less than inviting this winter, move your outdoor theater indoors and keep the entertaining coming. Best of all, you’ll be all set to experience the annual holiday specials in a whole new light. If you’re already having the time of your life with your backyard theater system, how about giving one to a beloved friend or relative? Who are the movie buffs and TV marathoners in your life? For that matter, which of your loved ones uses media to give business or organizational presentations? Imagine how thrilled these folks will be to receive a high-quality backyard theater system. Better yet, don’t just imagine it – make it happen! Backyard Theater Systems is happy to be your special Santa this holiday season. Place your order now – and be sure to clear an extra-large space under the tree! Can’t Decide Between Front and Rear Projection? Backyard Theater Systems Now Offers Both in One Package! The whole package fits into two padded, portable/storable carry bags. It also fits into your budget, because we’re offering it for an amazing $999. We’ve previously discussed the respective merits of front-projection and rear-projection outdoor theater systems, including the great advantage of being able to tuck cables and components safely out of view when using rear projection. We also added a beautiful 12-foot rear-projection screen to our product lineup. But you may still find yourself wondering whether you should purchase a front-projection system or a rear-projection system. Well, we’ve answered that question for you – because now you can have both in a single package! go outdoors with your outdoor theater system? Well, now you can, because this system can also work with an optional rechargeable battery pack. Enjoy your movie nights during camping trips, tailgating parties, or anywhere else that could benefit from some totally “off-grid” fun! If you’ve been looking for the ultimate in versatility, affordability and sheer fun factor, here it is. Don’t limit yourself to front projection, rear projection or even local electricity availability – contact Backyard Theater Systems and learn more about how you really can have it all! Summer’s here, and will be gone before we know it! For many people the summer season stirs up the desire to roam, from family vacations to personal cross-country road trips. But if you won’t be able to hop in the car and engage in a summertime adventure, don’t worry – and, your loved ones and your friends can get all of the fun (with none of the gas expense) by screening a festival of classic road movies on your backyard theater system. Here are some suggestions to get your engines revving. This road movie directed by Ridley Scott has grown in reputation from controversial to classic since its initial release in 1991. Geena Davis and Susan Sarandon offer a feminist take on the tried-and-true buddy movie formula as they set out on a weekend getaway and end up in a marathon of trouble from Arkansas to the Grand Canyon. Hitchhikers of all ages will have a lot of laughs accompanying Pee Wee Herman (Paul Reubens) on his quest, first to San Antonio and then to Hollywood, to recover his stolen bicycle. This crazy road trip adventure was Tim Burton’s first feature film. Bob Hope and Bing Crosby use camel power to get them through the desert to Morocco following a shipwreck, where of course they run into Dorothy Lamour. This classic 1940s comedy is one of the highlights of this comedy duo’s six “Road to…” movies. One staple of many communities’ summertime entertainment is the evening movie pool party. These events, which are typically held at municipal pools, allow folks of all ages to splash comfortably while watching family classics on a big-screen outdoor theater system. But you don’t have to wait for your city to take the initiative if you have your own pool and your own outdoor theater. And now Backyard Theater Systems offers the perfect complement to such a setup – a 12′ rear-projection screen, the latest addition to our SilverScreen lineup! Rear-projection setups are much to be preferred if you’re planning a pool-oriented movie screening. For one thing, you don’t have to worry about all the screen shadows created by swimmers’ heads and upper bodies bobbing above the water. Secondly, you’re moving that valuable (end electric) projection equipment well away from the water, with the screen providing an extra splash barrier. Last but not least you won’t have to worry about some kid’s float turning him in the wrong direction and exposing his eyes directly to a front-projected beam of light. Speaking of floats, you may want to make sure you have several types of floats, air mattresses, inflatable chairs and deck chairs on hand, even if you encourage the neighbors to bring their own. Insist on parental supervision for all the younger guests; this will relieve you of the need to play lifeguard throughout the screening. One final note: While you’ll obviously want to let the sun go down before firing up the projector, your guests may need some strategically-positioned light sources to help them get safely in and out of the pool. Ready for some big-screen poolside fun this summer? Get a Backyard Theater Systems package with a rear-projection screen, grab some family films and get ready to make a big splash!